Testing global navigation satellite system (GNSS) receivers can be done easily, reliably and cost-efficiently by using the R&S®SMBV100A vector signal generator. This GNSS simulator can generate GPS, Glonass, Galileo, and BeiDou signals for up to 24 satellites in real time. 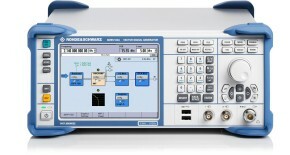 This application note explains how to perform automated receiver tests using the R&S®SMBV100A. The presented tests include TTFF, sensitivity, and location accuracy measurements, moving receiver and interference tests, and many more. Basic remote control examples are provided for the individual tests to ease programming. This application note further includes a short guide for parsing NMEA data.